Did you all grow up eating shepherd’s pie?? 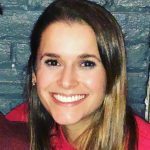 My family TOTALLY did – I loved it. Hearty beef, loaded with potatoes. I always doused it with ketchup… 🙂 it was SO GOOD! Lately I have been dreaming about my mom’s shepherd’s pie… But since she is all the way back home in Massachusetts I guess I’m on my own! 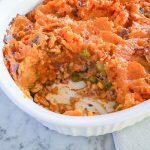 After making, and loving, my new recipe for Vegan Butternut Squash Mac and Cheese, I was totally inspired to try making healthy versions of other comfort food recipes – so I figured why not Shepherd’s Pie? First, this pie uses ground TURKEY instead of beef. 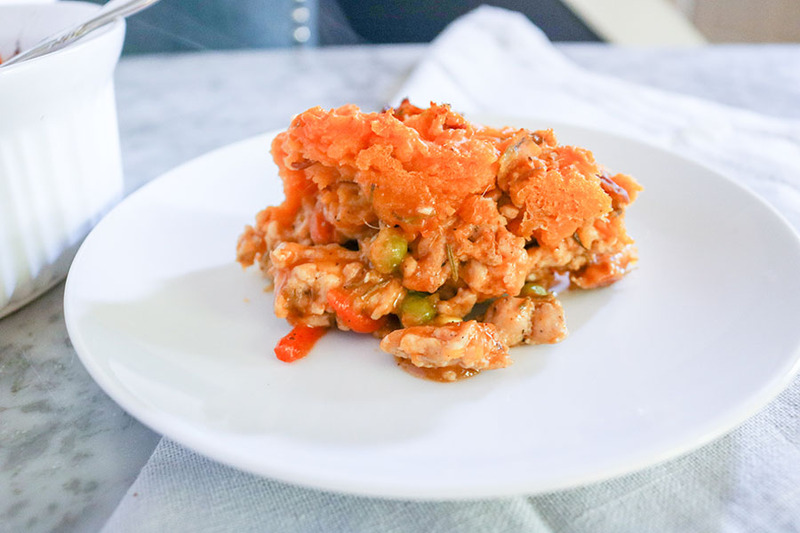 Personally, I LOVE ground turkey and sweet potato together – I think they are such a great combo! Sweet potato is so rich and decadent, which ground turkey is light flavorful. 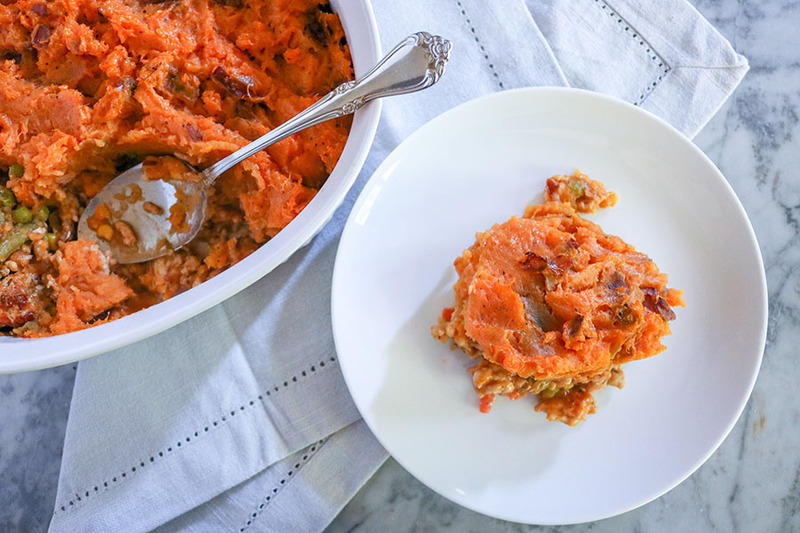 If you are at all concerned that this turkey/sweet potato combo may be too different from your traditional Shepherd’s Pie, feel free to only swap one the first time around! 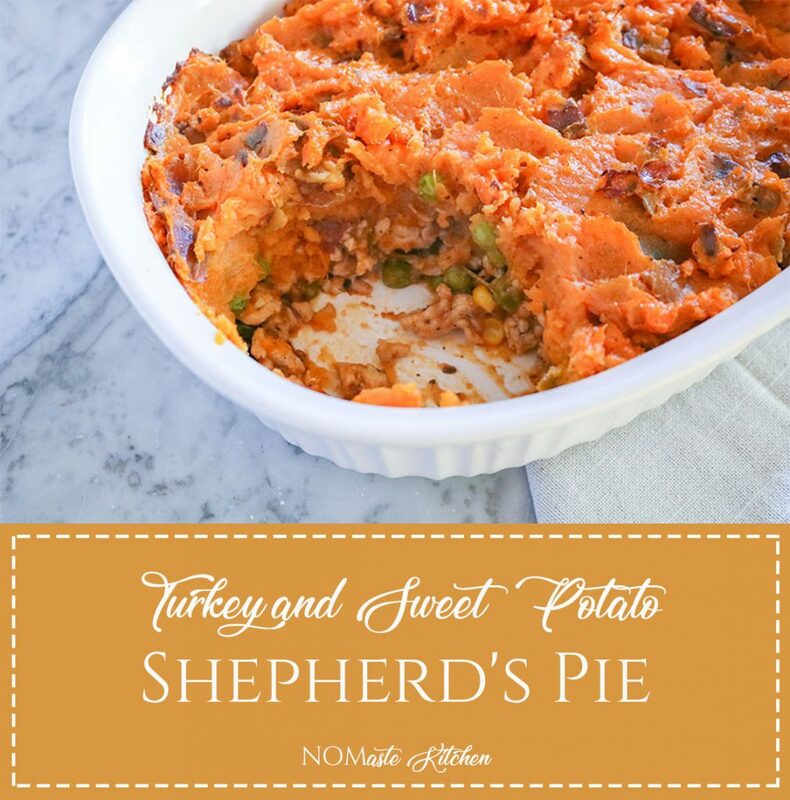 You can absolutely use this recipe to make a Shepherd’s Pie with turkey and white potato or beef and sweet potato! In fact, I am sure either variation would also be delish. Having said that, you SHOULDN’T be nervous because this Turkey and Sweet Potato Shepherd’s Pie is damn good, if I do say so myself! The ground turkey base is loaded with mixed veggies then seasoned with garlic, shallots, and fresh rosemary. A few tablespoons of ketchup or tomato paste combine with flour to make a delicious and thick gravy. 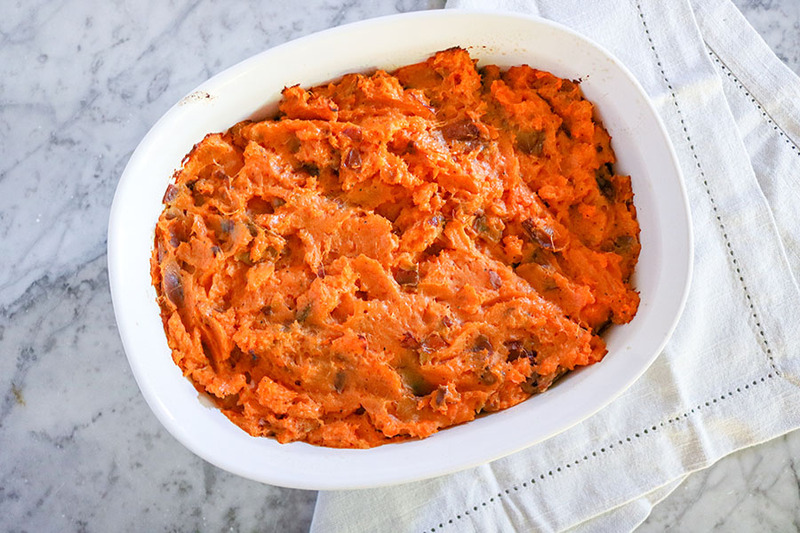 Then there are the mashed sweet potatoes… Did I mention I love sweet potatoes? Especially mashed. But if I am being honest, I have always had trouble making them creamy and delicious enough without butter or cream – that is until I experimented with THIS recipe! Amazingly – using broth (vegetable or chicken works) to boil the sweet potatoes instead of water made a HUGE difference in taste and texture of the final mashed sweet potato. I honestly have no idea why I had never done this before – it is such an easy way to amp up flavor in any veggie! But seriously, it was incredible! I can’t wait to try this hack with traditional mashed potatoes as well. Try it, try it, try it!! 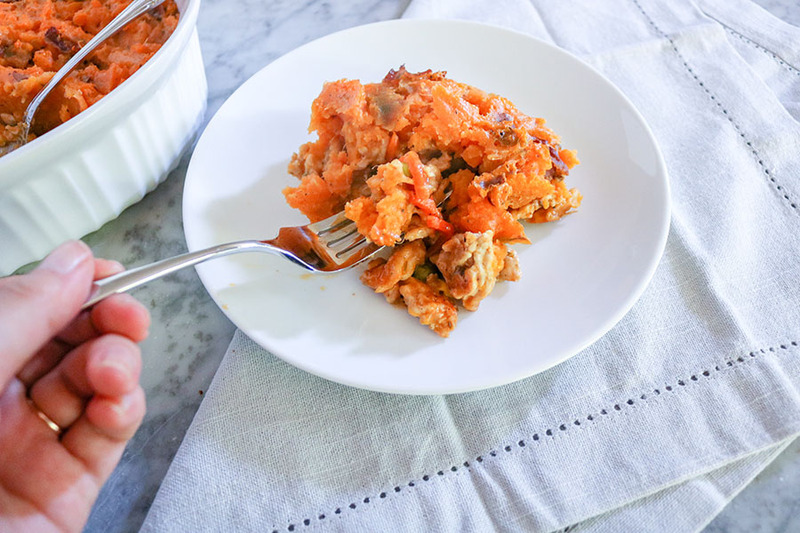 If you like sweet potato and ground turkey, I promise you are going to love it! Although this Shepherd’s Pie may not be the prettiest dish that I have ever made, it sure does hit the spot! And the best part, it still tastes good with ketchup 🙂 (that is, if you are a crazy person like me who puts ketchup and everything!). Comfort food does not have to mean bad food! 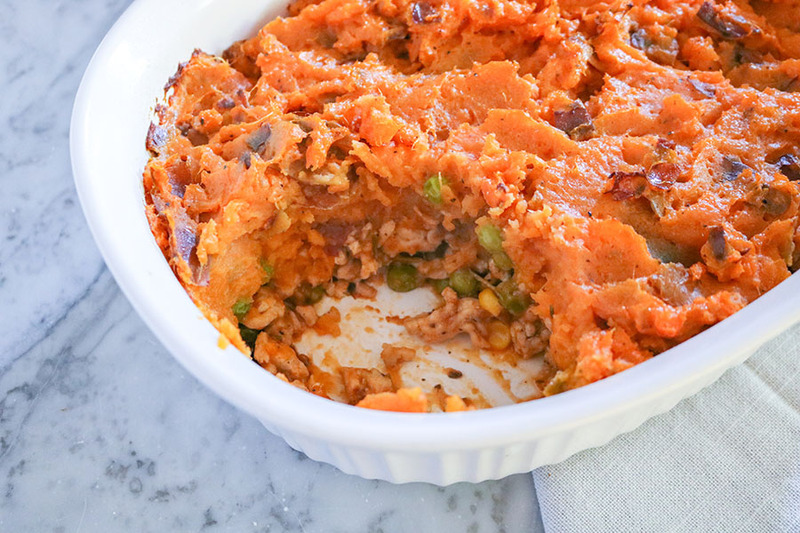 Check out this healthy-spin on the traditional Shepherd's Pie - made with ground turkey and sweet potato. 1/2 cup red wine any kind will do! Place chopped sweet potatoes into a large pot, cover in at least 1-inch of broth. Set pot on stove over high heat until boiling. Cook until sweet potatoes can be pierced with a fork (12-14 minutes). Reserve 1 cup of broth before straining in colander. In same pot, melt 3 tbsp butter. Add sweet potatoes and 1/3 cup milk to pot and mash until desired consistency is reached. Salt and pepper to taste. In a large pan, heat olive oil until shimmering. Add shallots, garlic, and rosemary - cook for 2-3 minutes, then add turkey, 1 tsp salt and 1 tsp pepper. Add 1 tbsp butter, frozen vegetables and sprinkle with flour. Stir through to combine. Add ketchup/tomato paste, wine, and 3/4 cup broth. Reduce heat and simmer until gravy has thickened. Season to taste. Pour meat into a greased oval baker or 9x13 inch pyrex pan - spread evenly. Spoon or pipe mashed sweet potatoes over meat. Bake for about 20-25 minutes or until sweet potatoes have begun to brown and dish is heated through. Hi Christine! Thanks so much for pointing that out that I missed the wine in my ingredient list! I have updated the recipe accordingly, but you should use about 1/2 cup of red wine. Any kind will do – even basic cooking wine. Hope you enjoy!